Be the first to share your favorite memory, photo or story of Daletta . This memorial page is dedicated for family, friends and future generations to celebrate the life of their loved one. 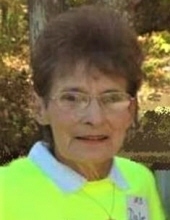 Daletta J. Grimm, age 77, of Tomahawk, WI, passed away on Tuesday, January 22, 2019, under the care of her family and Aspirus Comfort Care Hospice. Daletta was born on February 4, 1941, in Tomahawk, WI, to the late Willis and Gladys (Pfalzgraff) Ernst. Daletta grew up in the Spirit Falls area and was a 1958 graduate of Tripoli High School. After graduation, she moved to Milwaukee and began employment as a bank teller in Hales Corners. Daletta would tell stories of taking the train back and forth from Milwaukee to Tripoli before she moved back to Spirit Falls permanently in 1969. She owned and operated the Falls Inn for several years; selling in 1981. She then worked as a dietary assistant for over 30 years at the Golden Age and Riverview Nursing Homes in Tomahawk. Daletta had a love of all things crafty which started as a young girl sewing Barbie doll clothes that still today her great-granddaughter plays with. She shared her passion and talents by opening a refurbishing and re-purposing retail shop called “Daletta’s Country Treasures”. Daletta was known for her beautiful raffle baskets that she put together for giveaways and fundraisers. She loved fishing and watching and feeding the birds and deer that would come in her yard. 8 Great-Grandchildren, Keegan, Mariah, Landon, Scarlett, Rayna, Addison, Adilyn, and Jaxon. She is further survived by her special family at the Falls Inn who she loved spending time with. The family would like to extend a sincere thank you to Aspirus Comfort Care Hospice, especially Morgan and Amanda. A Celebration of Life for Daletta Grimm will be held at a later date. Generations Funeral Home & Crematory is assisting the family. You may view Daletta’s obituary and leave online condolences at generationsfuneral.com. To send flowers or a remembrance gift to the family of Daletta J. Grimm, please visit our Tribute Store. "Email Address" would like to share the life celebration of Daletta J. Grimm. Click on the "link" to go to share a favorite memory or leave a condolence message for the family.